The late, great Satoshi Kon is well known for deep, psychological works like Perfect Blue and Paranoia Agent, so when you hear the words “Christmas film” next to his name, I imagine you’re showing a confused look of surprise. 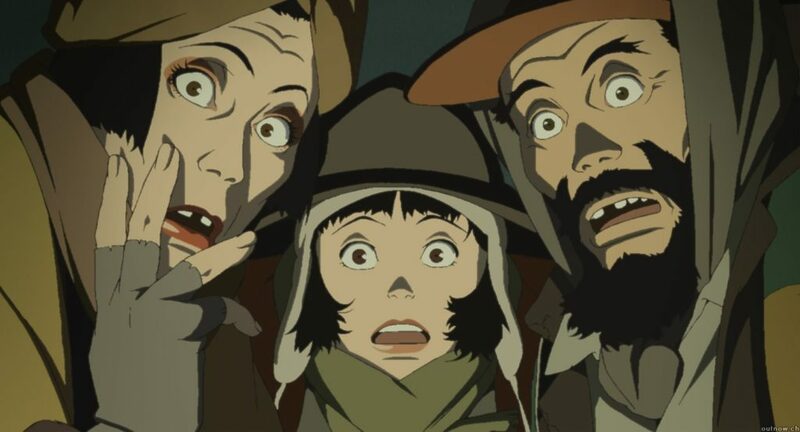 But here, with Tokyo Godfathers, Kon puts together one of his best works as a tale of hope and redemption, perfectly capturing the true spirit of Christmas. 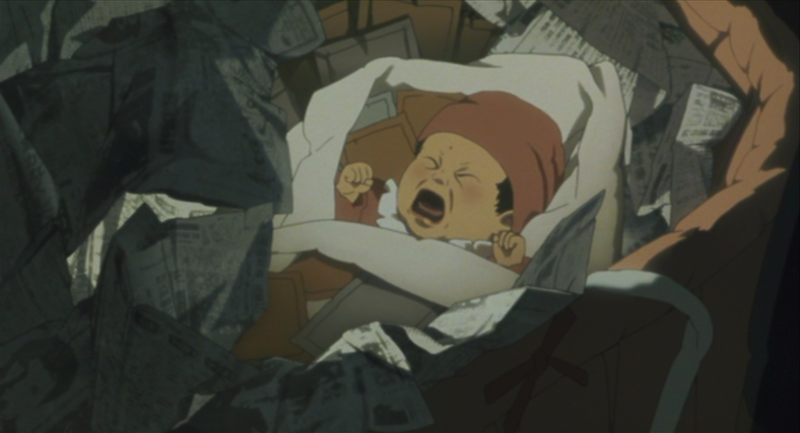 Loosely based on The Three Godfathers, a novel by Peter B. Kyne, the film takes three homeless people: middle-aged alcoholic Gin, drag queen Hana and teenage runaway Miyuki, and puts them in a madcap adventure to find the parents of an abandoned baby that they discover while rummaging in the trash on Christmas Eve. At first glance, this has all the hallmarks of a classic Christmas film, with a wintery Christmas setting, an oddball cast, and an entertaining romp to clear an objective; but underneath it still has Kon’s trademarks and examines darker sides of society. Homelessness is a problem in Tokyo like any other modern city, but instead of presenting the homeless as a blight on society, Kon’s approach is to make them more visible and more human. Gin, Hana and Miyuki all have different personalities, dreams and wishes just like other people, and the homeless in general are shown with respect, but it also isn’t afraid to show the bad times that these people go through. When we first meet our three leads, they’re just scraping along the bottom of the barrel: receiving food handouts, scavenging for trash and sleeping in tents in the park; and over the course of the film we see them getting badmouthed on a train because they smell, beaten up and occasionally uncouthly put down. But they are resilient, they get back up and they keep on going. They do feel like people and their characters are layered as such with a good amount of depth put into them, which really becomes evident once they pick up the baby and start caring for it. We see Hana’s desire to be a mother (despite being biologically male) in her vehement demands to look after it and not turn it in; and if her naming skills are anything to go by, she’s a romanticist poet, calling the baby Kiyoko, based on the Japanese for Silent Night. Gin is revealed to have been a father and uses that knowledge to look after Kiyoko, while Miyuki reveals studious and helpful sides as she picks up an abandoned book on childcare, intending to help look after the child. The film shows the group as a family and contrasts them with the other families we see – traditional happy families, struggling families, broken families; and each time this little band of homeless folk feels a lot more real. It really makes a point in how the family you choose doesn’t have to be the family you grew up with, but at the same time the concept of family isn’t something that should be shunned or run away from. While these points are seriously made and put together in some well thought-out scenes, it does find time to have a lot of fun with it. This is supposed to be a Christmas film after all! The plot is at times rightfully silly and there are some good jokes scattered here and there; like Kiyoko being the name of several female characters, and the multiple appearances of the beleaguered taxi driver who somehow became my favourite character outside of the main group thanks to the hilarious interactions between him and Hana. I wouldn’t call it a comedy but it definitely tries to see the funny side of things which gives it a lot of charm. I won’t spoil any of the major plot details here, but it definitely takes you for a ride as we see the group get into all sorts of trouble. Random coincidences work to drive the plot forward and they connect in surprising and occasionally funny ways. It must have taken a lot of planning to follow this type of structure as it has to track not just where our lead characters are, but where the side characters are as well. To pull that off while still being easy to follow gets a hearty round of congratulations from me. My only real complaints were the language used around Hana which seems dated in the current political climate surrounding the treatment of LGBT+ people, and firmly ages the film (this was originally released in 2003); and the final surprise of the film’s climax feeling a bit out there and throwing you for one. While it didn’t take me out of the film completely, it did have me going, “Seriously? Seriously? !” Some would call it a cop-out but let’s just say it presents a situation that is incredibly difficult to resolve in a more realistic manner. Animation is handled by Madhouse, the studio which has handled the majority of Kon’s other work. For an older film it holds up well with decent picture quality throughout and good animation with limited use of still frames. 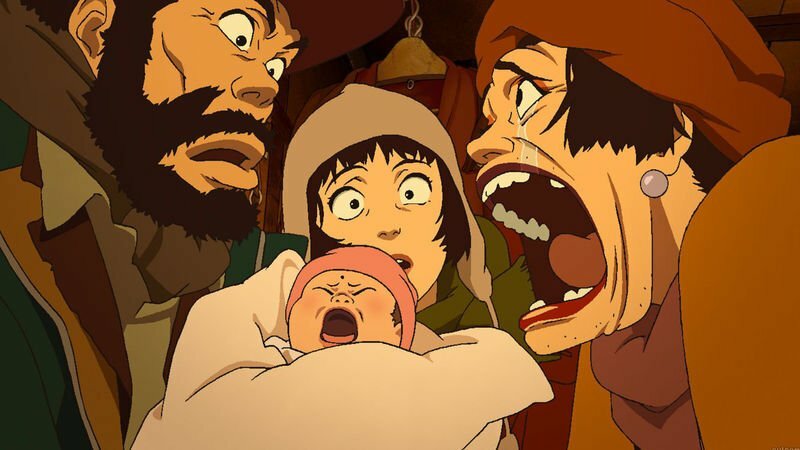 The colour palette is purposefully muted with a lot of greys, browns and dark greens, but it injects colour around certain characters (like the baby) to emphasise they are a stranger to the world that our homeless leads live in. Keiichi Suzuki (Saint Young Men, No. 6) provides a suitably punchy soundtrack when needed, with the main theme being particularly bouncy and jolly; yet more attention is turned to the sound design and the way it uses sound effects to provide immersion and realism. This is most noticeable in later scenes like when Hana is in the taxi and you hear other cars rushing past on the opposite side of the road. It keeps everything thematically together and having a bombastic soundtrack over the top wouldn’t have worked. The Japanese voice cast behind our leading trio: Aya Okamoto (Miyuki), Toru Emori (Gin) and Yoshiaki Umegaki (Hana); are better known as live action actors than for doing anime work and step up to the plate, delivering performances that really match their characters. There are also some more notable voice actors in there like Kouichi Yamadera (Togusa, Ghost in the Shell franchise) who plays the taxi driver and Yuusaku Yara (Jou Koizumi, Ping Pong) who plays Miyuki’s father. The film is also notable for including some Spanish for two Latin American characters that play a small but important part in the middle of the film. This release comes from Manga Entertainment in both DVD and Blu-ray formats. While this is a re-license after the rights for the previous Sony Pictures release expired, it’s the first time the film has been available on Blu-ray in the UK. I unfortunately don’t have a DVD copy to compare so I can’t advise on whether it’s worth upgrading if you previously bought a DVD copy. Extras include a selection of making of featurettes that include interviews with Kon, a look at Tokyo as the setting for the film, a look at the production process and an art reel combined with an interview with composer Suzuki. I’m not sure if any of these are new and one is clearly labelled as being taken from the original Sony Pictures/Animax release; but they are definitely a nice inclusion and reveal some interesting things about the film’s production. There’s a choice of Japanese 2.0 or 5.1 audio with clean and crisp white English subtitles that can be toggled on or off. 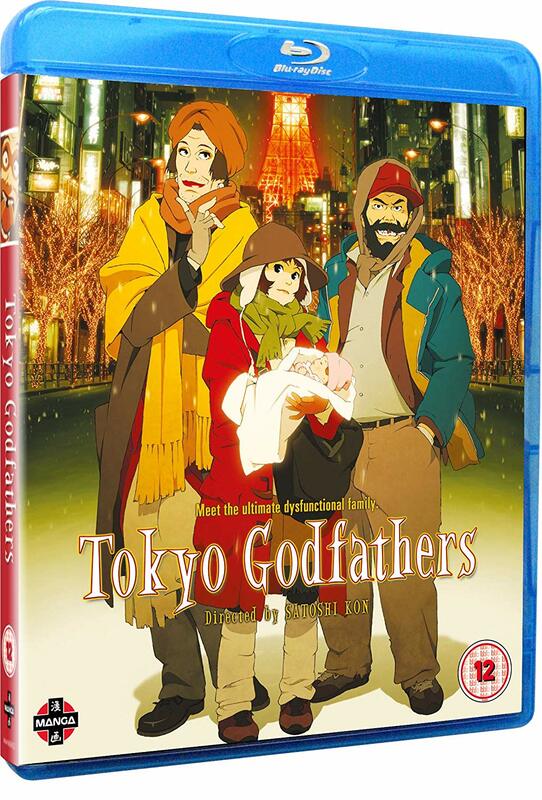 Tokyo Godfathers is a very enjoyable film and one of Satoshi Kon’s strongest, producing an intelligent reflection on homelessness, family ties and connections behind a fun, madcap Christmas adventure. While it is showing its age in places and is a little weird like most of Kon’s films are, this is his most accessible work and is full of charm. If you’re a fan you probably know what I’m talking about, but if you’re not, then this is a great place to jump into Kon’s work.